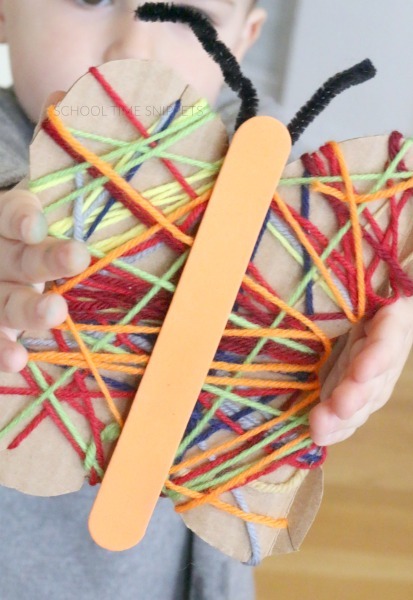 Create a one of a kind spring craft with some yarn and cardboard! My infatuation with yarn crafts began with our colorful yarn wrapped rainbow. 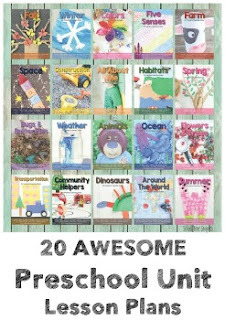 Since then we have added several more yarn wrapping crafts as they are great for working on fine motor skills! The other day we brought down our stash of yarn to create colorful and unique Yarn Wrapped Butterflies-- perfect for spring! We get to see butterflies in our garden every once and a great while. It always amazes me that these simple creatures will make everyone drop what they are doing to watch them flitter flutter through the air! With yarn, create your own unique and colorful butterfly! Yarn wrapping is a great way to work on fine motor skills. It is the perfect craft for spring. 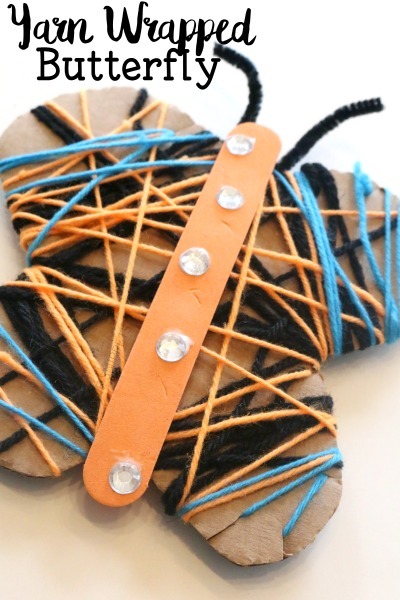 Begin prepping your Yarn Wrapped Butterfly by cutting a butterfly shape from a cardboard box. You may also find it necessary to make little snips around the butterfly to hold the yarn. Lay your stash out on the table and invite your child over to select one or more colors of yarn he/she would like to use for their butterfly. 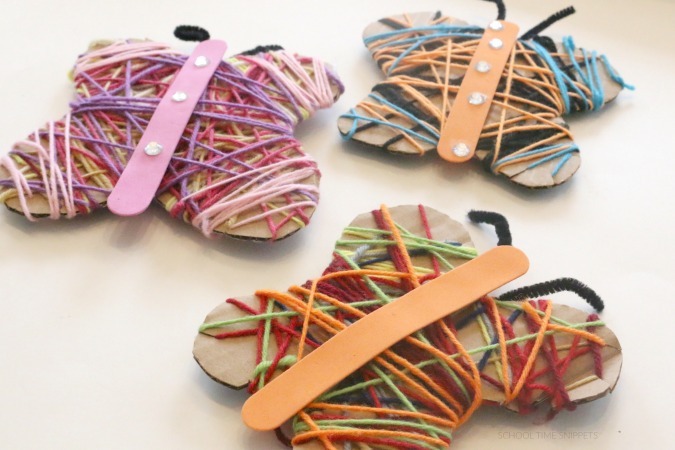 Select a color to use first and begin wrapping the yarn around the cardboard butterfly. The movement involved in the wrist, arm, and fingers make this a great way to strengthen those fine motor muscles! Holding the yarn works on pincer grasp-- not to mention all the hand-eye coordination involved in this task. Your little one will be hard at "work!" 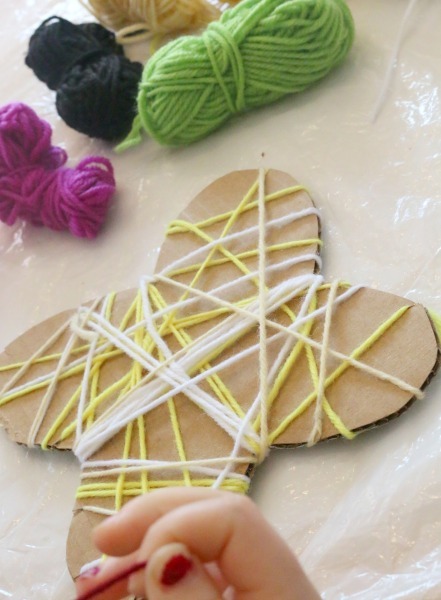 Once the child is finished wrapping the butterfly in yarn, cut a black pipecleaner in half and thread it through the yarn near the top of the butterfly. Next, you'll need to use a hot glue gun to make the foam stick adhere to the yarn. It is completely optional, but my daughter and I decided to add some gems to our butterfly body also using hot glue. Thus the butterflies are complete! We can't just make one of everything around here with four kids!